The dentist you choose is going to be a partner in your long-term oral health. As a result, you need to ensure you find the right one. While most people know finding a dentist takes some effort and consideration, finding a great local dentist that accepts your insurance policy can be an exhausting process. There are hundreds of different dental insurance providers out there and if you want to ensure your coverage is going to take care of your dental needs, you need to find a dentist that accepts it. While this may seem like an impossible and daunting task, it doesn’t have to be. 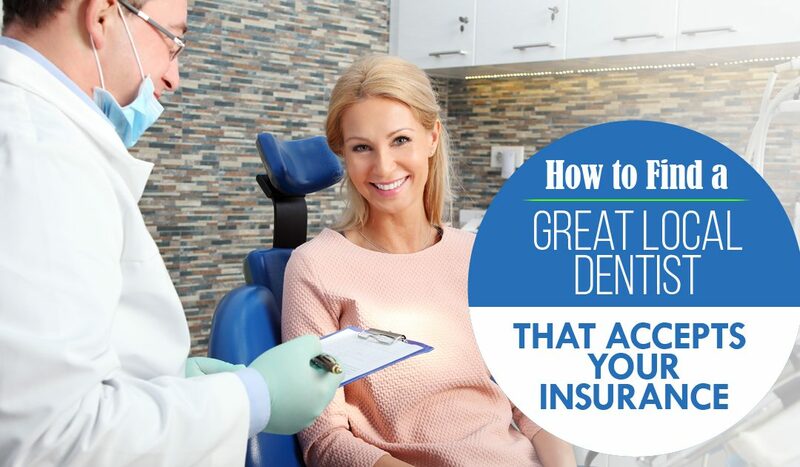 With the tips here you can easily find a great local dentist that accepts your insurance. Keep in mind, if you wind up choosing a dentist out of your network, then you could end up facing hundreds or even thousands of dollars in dental care expenses that won’t be covered. When you have insurance, there is no reason to face these types of bills. With a bit of time and effort, you can find the right dentist for your needs. The first step to finding a great dentist is to ask people you know for recommendations. While asking family and friends is a given, you should also ask your co-workers. This is especially true if you have dental insurance through your employer. After all, if someone in your office loves their dentist, there is a good chance that person will provide quality care and will also accept your insurance plan. However, if you are unsure, once you have a few recommendations, call the dental office and ask if they accept your insurance coverage. With most major dental insurance providers you can use their website to easily and quickly search for a list of local dentists near you. Each insurance provider is different but most websites will ask for your address or zip code and then will provide you with a list of dentists closest to your location. Other insurance providers may list local dentists alphabetically so be sure to select multiple dentists and do some more research before immediately booking an appointment just because they accept your insurance coverage. If your insurance provider doesn’t offer a search feature on it’s website, or if it’s outdated and difficult to navigate, then it may be wise to speak with your employer’s HR department. Your employer or HR department will likely be able to provide you with a list of dentists that accept the company’s insurance coverage. Either way, take some time to review the list carefully before moving on. This is an important step and one you shouldn’t rush through. You should now have a list of at least 5-8 local dentists that accept your insurance coverage. Next, you’re going to want to narrow down your options so you can find the best local dentist that accepts your insurance. First, always confirm that the dentist accepts your insurance and ask how much you’ll pay for your regular 6 month checkups and exams. Next, make sure the dentist provides the dental services you need. Some dentists have specialties or only work with children or adults. Choosing a family dentist is usually a safe option because they typically provide a wide range of general dental services for both adults and children. What are the dentist’s hours? Do the office and appointment times fit your busy schedule? You’re not going to want to miss work or rush on your lunch break every time you need to see the dentist. Does the dental office offer emergency services? You may not have an emergency right now but it’s always a good idea to work with a local dentist that provides emergency services just in case. Make notes throughout each call and include a note about your “first impression” when speaking with them. Did they sound friendly, were they rushing to get you off the phone or sound annoyed to be speaking with you? These first impressions will often tell you a lot about the offices quality of care. Cross any dentists off your list that didn’t meet your needs and move on to the next step. As you can see from the results above, Google can easily find Dr. Ghassan Abboud listed on1stfamilydental.com. Taking this extra time to search for the dentist confirms that they’re still a local dentist in your area, that they have an online presence, and that there are previous patients that have been willing to publicly endorse the dentist or practice with 4-5 star reviews across multiple directory sites. You should now have at least one reputable local dentist that accepts your insurance plan. The final step is to call their office, ask any final questions, confirm one more time that they accept your insurance, and then book your appointment. Your insurance benefits may be expiring at the end of the year! Unfortunately, dental insurance benefits don’t roll over to the next year so make sure you use them before they expire. If you’ve already reached your deductible for this year, pushing off any major or costly procedures to next year could cost you hundreds more in out-of-pocket expenses. Don’t wait, visit your dentist before the year over. Have questions about your benefits? We can help! Contact us today. Looking for a great selection of family dentists in Chicago, Addison, Arlington Heights, Aurora, Elgin, La Grange Park, or Roselle, Illinois? If so, click the call button below to connect with our call center where we can quickly confirm your insurance and get you an appointment scheduled in just a matter of minutes, or click the “Book An Appointment” button to book online.